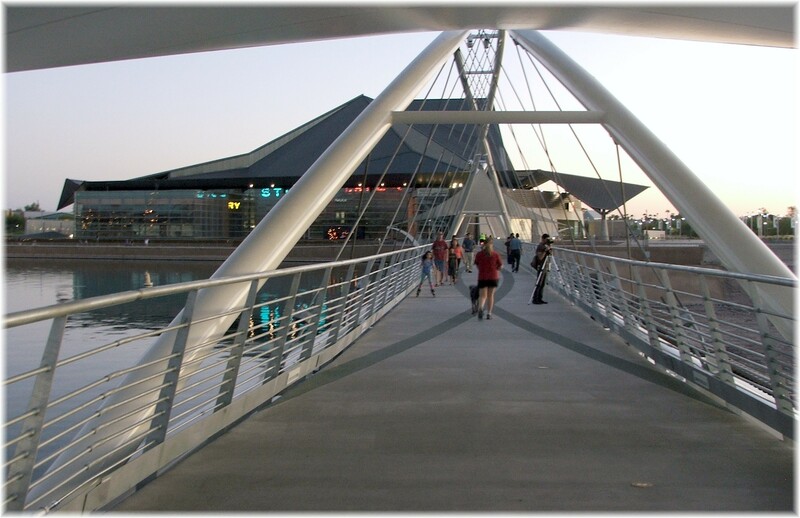 One Oct. 18, 2011, the new Tempe Town Lake Pedestrian bridge opened, connecting the north and south shores of Tempe Town Lake. The bridge consists of 4 spans, each measuring 228 feet, weighing 165,000 lbs. The bridge protects the bladders of the dam from the sun and contains a built-in sprinkler system to cool the bladders when needed. This was the point of contention when one of the bladders failed on July 20, 2010, that the maintenance had been inadequate. 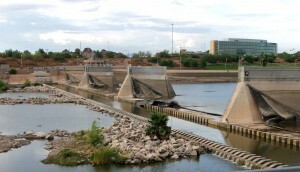 The picture to the left was taken just days after the dam failed and sent over 750 million gallons of water down the Salt River. The lake was dry for 3 months before the dam was repaired and the lake refilled in October 2010. 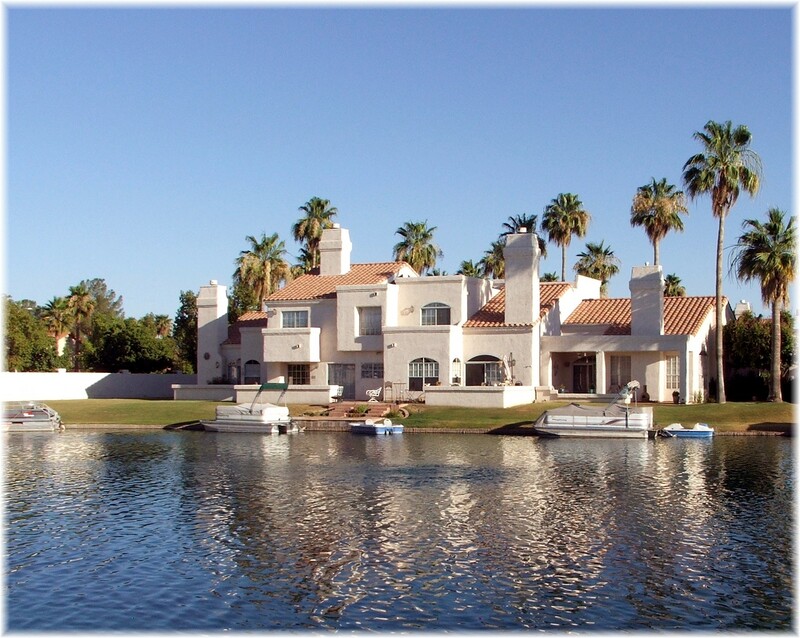 Waterfront Homes, Patio Homes, Condos, and Townhouses in The Lakes in Tempe, Az. 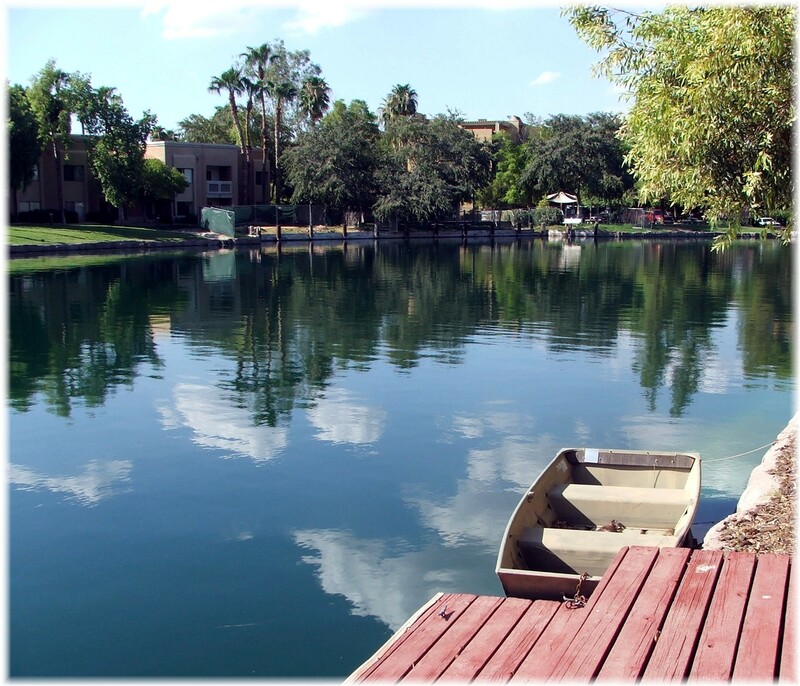 Within The Lakes master planned lake community are over 260 waterfront homes that include condos, townhouses, patio homes and single family homes built around a 50 acre man made lake in Tempe. Residents enjoy a community pool and spa, tennis courts, basketball and sand volleyball court. The club facilities are open to residents for parties, receptions and host many of the community sponsored activities such as water aerobics, boxercise, Yoga classes, and The Lakes Women’s Club. More information can be gathered at The Lakes Community website. I found the following quote by Franklin D. Roosevelt, “There are as many opinions as there are experts.” Speculating on real estate trends is a favorite past time for anyone, especially as of late. It is easy to get caught up in the broad “one size fits all” real estate commentaries, so read on to see what’s really happening with Phoenix area real estate. To truly understand, it is always best to look at the data and identify trends. 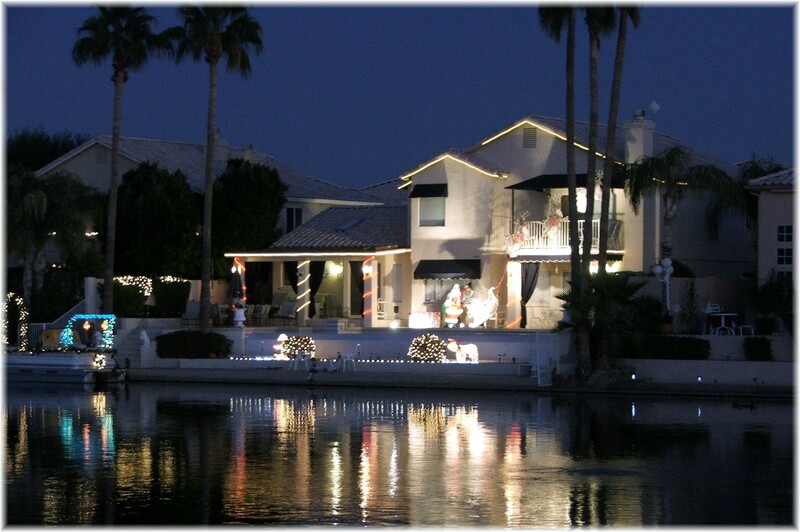 Waterfront Townhouses in The Lakes in Tempe, Az. One of the many residential housing options offered in The Lakes master planned lake community is Harbour Village, with spanish architecture and lush green landscaping. 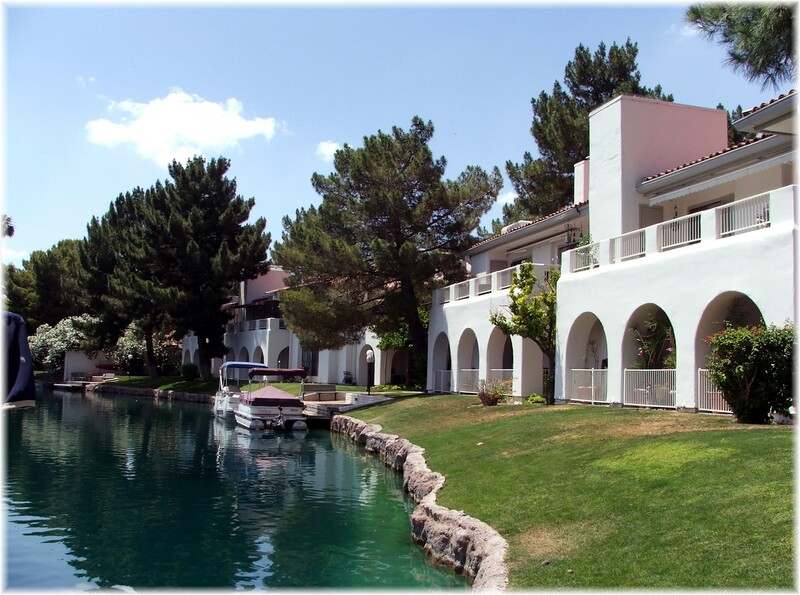 Not a large complex, Harbour Village consists of 40 units, 12 of which have waterfront views of the lake. 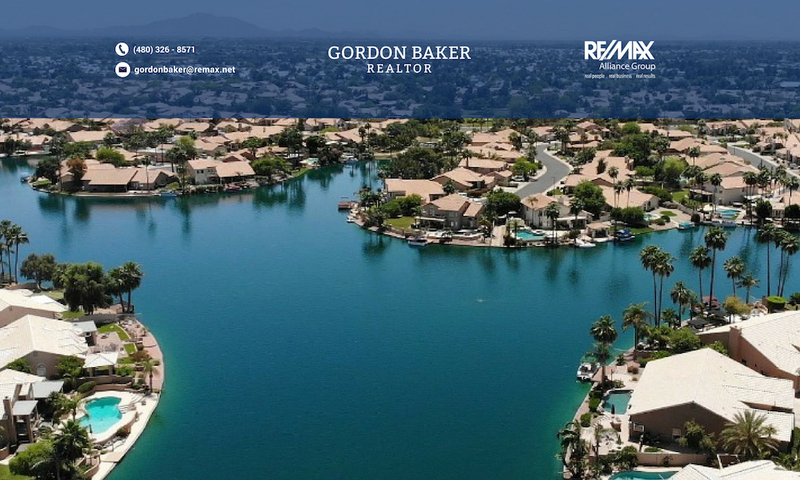 These waterfront townhouses have found favor with prospective buyers since they typically sell within 2 months of being offered for sale, and are strategically located to take advantage of the widest part of the the lake.